You've been in an auto accident! You're in pain! Your life has been changed and it probably wasn't even your fault. We know that even a fender-bender can cause pain and hardship. It could affect your work and play time. Our goal is to help ease your pain, help you recover, regain your mobility, and get back to work as quickly as possible. At the Healing Touch Chiropractic in Midtown Sacramento, Dr. Darrick Lawson, Dr. Justin Kamerman, and Dr. Daniel Miller will pay special attention to injuries unique to car accidents. 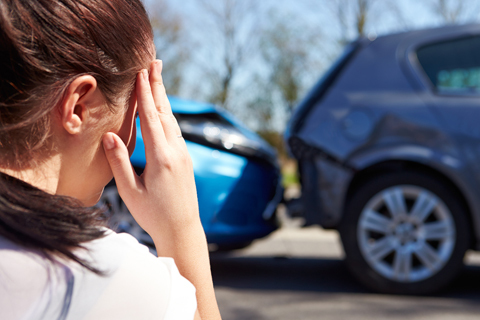 Did you know that most auto accident injuries are not detected for months or even years? Most auto accident victims are unaware of hidden injuries because the pain is masked by medications. Sadly, most doctors don't even have the training to detect soft tissue injuries, so they prescribe drugs to cover up your symptoms. Insurance companies win because they get released from liability by requesting that victims settle their cases before they even get checked for soft tissue injuries! Don't settle with your insurance company until your injuries have been thoroughly documented and treated. We look forward to serving you. Please give our office a call to book your FREE CONSULTATION today. We can be reached at 916-447-3344 or the contact us section of this web site! Dr. Darrick Lawson, Dr. Justin Kamerman, and Dr. Daniel Miller at The Healing Touch Chiropractic in midtown Sacramento offers patients excellent treatment of whiplash or spinal pain associated with automobile injuries. Chiropractors are specialists in treating non-surgical spine injuries such as whiplash, neck and back injuries from automobile accidents. The job of The Healing Touch Chiropractic team is to help patients overcome the pain and disability associated with whiplash or spinal pain. Whiplash occurs when your head is hurled violently backward causing a (hyperextension) and or a forward (hyper flexion) - injuring the neck. The injury can be worse if your neck may have been turned to the side when the accident occurred. The injury is one of the most common car accident injuries people suffer, especially on the busy highways and roads surrounding the Sacramento area. The effects of a whiplash injury can be short term or long term and are often accompanied by a concussion. Often whiplash injuries can extend to shoulders and arms, and may cause injury to joints, spinal disc, ligaments, nerves and cervical, thoracic, and lumbar muscles. 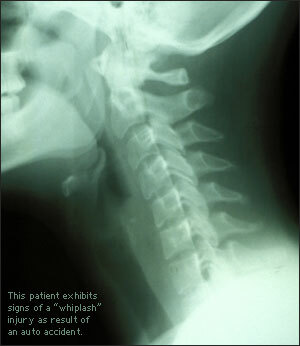 Whiplash can be diagnosed with a simple physical examination or using x-rays by a chiropractor or medical doctor. Either one will use x-rays to see if there are any fractures of the vertebrae and the extent to which the alignment of the neck has been altered. The Healing Touch Chiropractic has x-ray capability. A whiplash injury can easily cause your neck's natural curve to be reversed. This causes the uneven distribution of the weight of your head and may further misalign your vertebrae. This condition can lead to arthritic degeneration and recurring pain. Dr. Darrick Lawson, Dr. Justin Kamerman, and Dr. Daniel Miller have been treating patients for over 30 years. We also offer the area's only Lordex Spinal Decompression machine for the treatment of disc injuries. The courses of treatment will vary depending on the extent of your injury and if you have injury to joints, discs, ligaments, cervical muscles, or nerve roots. The Healing Touch Chiropractic work with your medical doctor and/or physical therapist to plan the best combination of therapy. This may consist of heat, cold, traction, trigger point therapy, massage, exercise rehabilitation, and neck or back exercises. Chiropractic treatment of whiplash injuries realigns the neck and helps regain muscle flexibility. How do you know if you've been injured in an accident? Do you have pains between the shoulders, low-back pains, tremors, rapid heartbeat? If your answer to any of these questions is YES, you may be suffering from a misalignment or dislocation due to whiplash. At The Healing Touch Chiropractic, we are eminently qualified to assess any problem following tests and examination. Those aches and pains you are experiencing after your car accident, injury or fall are an indication that the spine has suffered damage. If ignored, the pain may go away, but the spinal damage will not heal correctly. These untreated spinal injuries are the source of future pain, arthritis and radicular symptoms. The permanent damage that results may lead to a life of chronic pain and discomfort. At the Healing Touch Chiropractic, we have the tools to diagnose your injuries. We have an on-site x-ray lab and other diagnostic tools to locate and document the specifics of your injuries. Our patients love the personalized attention and learning about the source of their discomfort. Your attorney will love The Healing Touch Chiropractic and the attention to detail and professional documentation. Once we have diagnosed your injuries treatment may include chiropractic adjustments, massage therapy, rehabilitation, physiotherapy, traction and other pain relief techniques. Treatment is tailored specifically for you and your injuries, it is clinically supported, and best of all, it feels so good. You will leave your appointments feeling better and you will be benefiting from the expert injury care of Dr. Darrick Lawson, Dr. Justin Kamerman, and Dr. Daniel Miller at The Healing Touch Chiropractic. If you have been involved in a car accident and need treatment, The Healing Touch Chiropractic's staff will assist you with billing questions and insurance issues. In many cases, your auto insurance will cover all the expenses of treatment. If your policy has a deductible or co-insurance all fees will be discussed up-front with you. There are no financial surprises at The Healing Touch Chiropractic. We even take attorney liens. Please do not wait for symptoms to develop - call us at 916-447-3344 to schedule an appointment today.